This Week’s Key Cog – Anthony Marshall. Marshall was named co-Mountain West Player of the Week after averaging 20.0 points and 9.0 assists in the two home wins. He also added 5.5 rebounds, 3.0 steals, and 1.5 blocks per game while shooting 54.8% from the field in the victories. Play of the Week – If you want to know how the Rebels play, just watch the first two minutes of this video, where you’ll find explosive offense in the form of high-paced, transition three-pointers and drives to the basket. All five starters score while the team opens up a 19-point lead in under seven minutes against TCU on Wednesday. Top of the Mountain – No team can run with the Rebels in the Mountain West Conference, at least not statistically. On the season, Oscar Bellfield’s 5.1 APG leads the conference, and Mike Moser’s 11.3 RPG also leads the MWC. In conference play, Marshall is averaging 22.0 PPG, which, of course, leads the conference. Chace Stanback’s 47.7% three-point field goal percentage? You guessed it, the best in the (Mountain) West. Stats Central – Continuing the theme of offensive production, the Rebels are among the top 10 in the nation in points per game, assists per game, and three-point field goals made. They’re in the top 25 in steals per game, blocks per game, rebounds per game, and offensive efficiency as well. You’re going to want to watch this team play when you get a chance. What’s Next? – Two road games for UNLV this week, beginning with Boise State on Wednesday (10:00 PM ET) followed by Air Force on Saturday (9:00 PM ET). Both teams have struggled this season and are a combined 1-5 in MWC play, but Boise State is 8-1 at home on the season and road games in this, or any, conference are never easy. Both games are televised on The Mountain TV Network. Trending DOWN Because… – Their pursuit of an undefeated season came to a screeching halt on Saturday. The Orange were pretty much dominated from the tip at Notre Dame, as they went down 11-2 in less than three minutes and never came closer than six points behind in the second half. Even more shocking was the pre-game ruling that Fab Melo was not with the team on the road trip due to academic issues, and it’s still unclear why he was suspended or when he’s coming back. Melo’s absence was huge in the loss, as the Orange got outrebounded by 13 and recorded just two blocks in the game (Melo averages 3.0 blocks in conference play alone), and Jack Cooley dominated in the paint for the Irish. The team recovered with a big win at Cincinnati on Monday, and assuming Melo returns shortly then their slip-up in South Bend should not be all that significant down the line. This Week’s Key Cog – James Southerland. He had 15 points on Saturday and his outside shooting was the sole reason why Cuse got within six points late in the game. The junior forward then finished with seven points, seven boards, and two blocks in Monday’s win over Cincinnati. Most impressive was his +19 plus/minus ratio in the seven-point victory, meaning the team played exceptionally better when he was on the court. Play of the Week – Sportscenter anchor Steve Levy (although he’s great) decides not to make a call on this play, but it didn’t go unnoticed by us. Watch Kris Joseph drive baseline and slam over Cincy’s Yancy Gates on Monday. Stats Central – After Dion Waiters played just 12 minutes on Monday, the Orange now have four players averaging between 22.3 and 22.8 minutes per game (Scoop Jardine, Brandon Triche, Melo, and Waiters). Syracuse still leads the country in steals per game (10.3) after their full-court pressure recorded several late swipes in the comeback attempt at Notre Dame. What’s Next? – Syracuse plays just one game this week, at home against West Virginia on Saturday (1:00 PM ET, ESPNU). We’ve heard rumors that Melo’s suspension may be lifted by this weekend, but it’s still unclear. Either way, the Orange will be in for a dog fight against the tough Mountaineers (5-2 in Big East), but should win at home or else there will be more serious questions to ask about team. Trending DOWN Because… – They suffered a bad loss by blowing a big second-half lead against Nebraska in the waning minutes on Wednesday, which led to an RTC in Lincoln and completed a three-game losing streak for the Hoosiers. Indiana (16-4, 4-4 Big Ten) bounced back with a dominant win over Penn State on Saturday, but Tom Crean’s team has been figured out a bit and needs to beat someone on the road to gain some confidence back. The Hoosiers sit in seventh place in the Big Ten and are allowing a 109.8 defensive efficiency in conference games that ranks in the bottom 50 nationally. This Week’s Key Cog – Cody Zeller. Indiana’s recent losses are certainly not the fault of their freshman forward. Zeller averaged 18.0 points, 5.5 rebounds, and 2.0 blocks on 70% field goal shooting this week. He continues to be very productive and shoot an extremely high percentage from the field, which makes us wonder if the Hoosiers need to start feeding him the ball more and more inside. Play of the Week – Against Penn State, Jordan Hulls makes a nifty spin pass to Verdell Jones III for a layup after a steal in transition. Rank and File – Voters have slotted Indiana #16/17 in the AP and ESPN/USA Today polls, respectively, this week. Perhaps we’re all overreacting to the Hoosiers’ latest losing streak a bit too much, or at least the argument can be made. On the season as a whole, Indiana is still ranked 10th in Ken Pomeroy’s team rankings, 11th in Sagarin’s numbers, and 20th in the RPI. They came in at #14 in the RTC Top 25 after all the shake-up from the crazy weekend. Stats Central – During conference play, the Hoosiers rank in the bottom half of the Big Ten in every major defensive statistic, from defensive rebounds to turnovers forced to points per possession. If IU can take solace in anything, they are coming off their best performance of the conference season by holding Penn State to 34% shooting in the 73-54 win on Saturday. What’s Next? – It’s a big week for Indiana with a road date at Wisconsin on Thursday night (9:00 PM ET, ESPN2), where the Hoosiers are seeking a confidence-building road win to prove that they are still a contender in this conference. Wisconsin has slipped up three times at home this year, a rarity in the Bo Ryan era, and the Badgers need this win badly as well. It should be a fun one to watch. Then, Indiana gets Iowa at home on Sunday (6:00 PM ET, Big Ten Network), a game that cannot be overlooked. The Hawkeyes are a surprising 3-4 in conference already with road wins at Wisconsin and Minnesota. This entry was posted on Tuesday, January 24th, 2012 at 2:14 pm by EJacoby	and is filed under Regular Features, tracking the four. 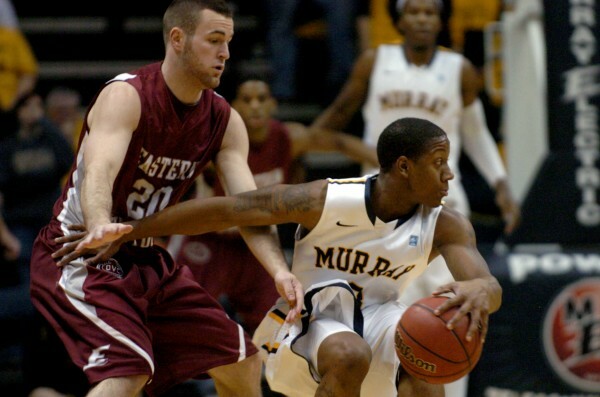 Tagged: anthony marshall, assembly hall, at Morehead State, at Notre Dame, big dance, big east, big ten, billy kennedy, brandon triche, carrier dome, chace stanback, christian watford, cody zeller, dave rice, defensive struggles, dion waiter, donte poole, explosive offense, fab melo, free throw rate, hoosiers, indiana, isaiah canaan, ivan aska, Jack Cooley, james southerland, jim boeheim, jordan hulls, ken pomeroy, kris joseph, mark gottfried, mick cronin, mike moser, mountain west, murray state, mwc, ohio valley, Orange, oscar bellfield, ovc, racers, rebounding woes, rpi, runnin' rebels, sagarin ratings, scoop jardine, steve prohm, syracuse, thomas & mack center, tom crean, top 25, unbeaten, undefeated season, unlv, verdell jones III, vs. New Mexico. You can follow any responses to this entry through the RSS 2.0 feed. You can leave a response, or trackback from your own site.